Peterborough United play Southampton U21's in the group stages of the Checkatrade Trophy. 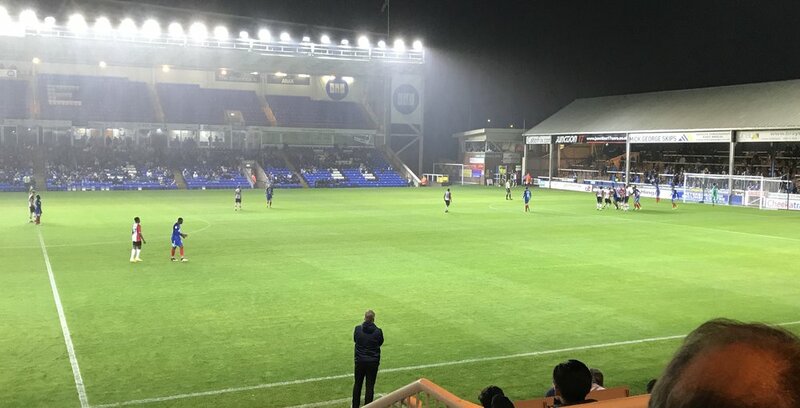 I watched with interest the Checkatrade Trophy games at Peterborough United and Swindon Town as they hosted Premier League U21 sides from Southampton and West Ham United in the group stages of the tournament. Swindon Town entertain Premier League West Ham United U21 side in the Checkatrade Trophy. The format of the competition follows on from last season with Premier League U21 sides entering the competition with a desire to give Premier League youngsters much needed competitive action and experience against League 1 and League 2 sides as the Premier League look to help its clubs develop its players and coaches. A competition formerly known as the Johnstone's Paint Trophy, is one I know and respect the value of having reached the final of it when I was Manager of Scunthorpe United in 2009. We unfortunately lost that final 3-2 to Luton Town, following extra time. On the day Grant McCann scored a fantastic goal at Wembley Stadium. Grant is now the Manager of Peterborough United and I enjoyed catching up with him for a coffee in his office before the game against one of my former clubs, Southampton. We talked about some of the events around the final, and in keeping people together and hungry for success, our culture, and how it played its part in us being promoted via a play-off final victory over Millwall six weeks later. Grant took over as Manager of the Posh last season and I've been following with interest his progress. I signed Grant from Barnsley and he played a pivotal role on us gaining promotion to, and remaining in the Championship. A fantastic achievement for a club like Scunthorpe United at the time. Grant was a Northern Ireland International and with a wand of a left foot, deadly from free kicks, superb with his quality of delivery from set plays, and vision to unlock defences with his accuracy of passing. Grant hates losing so I've been interesed to see how he has managed to evolve from a player to a coach and now to the pressure of management. Never easy for a young coach to be given the time to learn, make decisions and thus make mistakes. The final decision is the Managers and the buck stops with him. Different to that of a coach as the consequences of decisions are job and career threatening. As we all know it is a results driven business we operate in and 55% of 1st time Managers never get another opportunity ! Speaking with Grant I was impressed on how open he was with dealing with his change of role and the pressures of Management and dealing with results. Experience of being in situations can only improve the decision making process as long as you're prepared to reflect and learn from them. Grant has taken steps to keep improving as a leader and I could tell how well he is doing it. Grant works well with his Assistant David Oldfield. A good Assistant Manager is important and giving him responsibility, helps build trust and the ability to also flourish. I was pleased to have Andy Crosby with me for several years and Andy is now well equipped to be a Manager himself. Being able to switch off at times for yourself and the family is critical and never easy at the beginning of your career as you want to do everything, and may feel guilty if you have 5 minutes off, however for longevity of Management and family life, very important to factor in to a busy schedule. I like to ask questions and remember asking Sir Alex Ferguson when we played his Manchester United side in the FA Cup at St. Marys about his longevity in football. Given for granted you have to win games, what else do you do ? Staying healthy, keeping up with the latest trends and having a hobby outside of football is very important was the answer from one of the greatest Managers of our time. Being able to switch off, change the thought process at times and refresh the mind can make you more productive and should be viewed as an important part of developing as a leader. Peterborough United have started the season well and sit top of League 1 however speaking with Grant you can tell he has that hunger to keep his players feet firmly on the ground and working hard to keep improving. The relationship Grant has with his owner Darragh MacAnthony, is as with any Manager/Owner the most important at the club. Grant is fortunate to have an experienced and passionate owner who will continue to guide Grant and give him the time and support required to keep developing. Grant has been a successful player for the Posh and has built up a good understanding with the owner. I had a brief chat with him and Barry Fry another experienced football legend at the club, and I'm sure that experience they have can only be of benefit to a young hungry Manager making his way in the game. On the evening it was a well deserved victory over a young Southampton side who only had the experience of goalkeeper Alex McCarthy in the side. Alex was one of my former players at Reading who was returning to playing again following a period out last season through injury. In the dugout though was vastly experienced coach Martin Hunter, who is Saints Technical Director, and one of my former players and budding coach and potential Manager in the making Kelvin Davis. Both passing on their knowledge to the young Southampton professionals who would have gained valuable experience from the evenings contest. 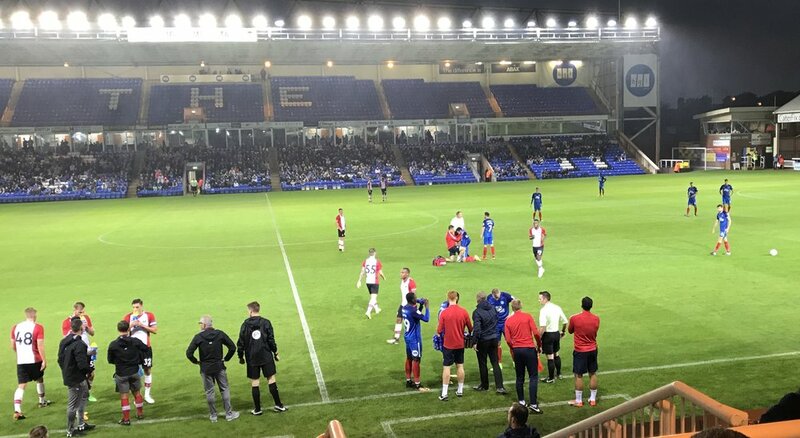 A stop in play as a Peterborough United player receives attention on the pitch, whilst Martin Hunter and Kelvin Davis offer advice to the Southampton players on the left of the picture, and Peterborough United Manager Grant McCann and Assistant David Oldfield talk with their players by the Technical area. I was interested to watch the left footed centre back for Peterborough United on the evening Ryan Tafazolli, who was a young player at Southampton when I joined them in 2010 and was part of Martin Hunters U21 team. Ryan moved on to further his career and I was pleased to see how well he has developed. The same can be said for Harlee Dean who was part of that young group and having moved to Brentford has just completed a £2million move to Birmingham City in the Championship. Ryan Tafazolli playing left side centre back of a 3 man defence for Peterborough United against a former club Southampton. I was interested to watch the tactics of all four teams. Peterborough United played a young goalkeeper with three dominate centre backs. Two wing backs provided the width to the team. Two central midfield players worked tirelessly and one player in advance of them just in behind two strikers who had pace and a willingness to run the channels. A 1-3-4-1-2 formation with Southampton adopting a traditional 1-4-2-3-1 formation. I have talked with Martin over the years going back to my time as Manager of Scunthorpe United when Martin was part of the FA. One of our discussions was about playing against a three man defence and to put three forwards up against them. The very quick Saints forward line on the evening appeared to take up these roles at times. Peterborough were very dominate against Southampton at corners. The Saints set up with a zonal defence which struggled to deal with outstanding delivery and desire to attack the ball from the powerful Posh players. Infact Peterborough scored from an in-swinging corner in the opening minutes of the game to take the lead. Always interested in observing corners, and on the evening The Posh kept 3 players up for corners they were defending. The Saints kept 3 back marking them. I would have liked to have seen one of the Saints defenders going for a short corner to see how the Peterborough player would have reacted. Peterborough United keeping 3 players up front whilst defending a corner against Southampton with Manager Grant McCann looking on from the Technical area. Another young Manager who has had a promising start to the season is David Flitcroft who joined Swindon Town in the summer. I watched with interest as his team who were top of League 2 at the time played against West Ham United U21 Managed by Terry Westley. Swindon were physically a big threat from set plays for the young Hammers side that set up with a 1-4-2-3-1 formation in a game that saw the visitors win 3-2 with goals from Samuelsen, Makasi and a late winner from Kemp. It's a good opportunity that the competition provides for not only players but also Academy coaches to experience Managing against League Managers in competitive competition. It was good to see other young Managers in the stand watching the game and developing their knowledge. Karl Robinson of Charlton Athletic and Harry Kewell of Crawley Town no doubt would have been looking at some of the youngsters on display with a view to the loan market. I sat next to David Flitcroft the week later as we both watched Southampton play Wolverhampton Wanderers at St. Marys. I believe it's important to keep following with interest what is going on in the game, the latest trends and researching players. For a Manager it's beneficial to watch a player live instead of just from video clips of him. I believe the Checkatrade Trophy provides the platform for young players and coaches of both the Premier League, the PL, and English Football League, the EFL to gain valuable experience, make decisions, make mistakes and develop their careers as individuals and within a club and team structure. I was watching with interest this week the Carabao Cup 2nd round ties and the contrasting fortunes of two teams I managed in the Premier League. On Tuesday evening I was at the Madejski Stadium, home of Reading, as they won following extra time against Millwall and on the Wednesday evening I was at St.Marys as Southampton played hosts to an impressive looking Wolverhampton Wanderers side who progressed with a 2-0 victory. The sky at night. Southampton take a throw in at St.Marys against Wolves in the Carabao Cup 2nd Round. The West Midlands outfit made several changes to the team that has started the League season so impressively under new Manager and former goalkeeper from Portugal, Nuno Espirito Santo. I was impressed by a side that is growing a strong identity and clearly has strength in depth in it's squad to handle a competitive challenge for promotion from the Championship to the Premier League this season. The side appears well drilled with a defensive shape that looks as if it will be hard to break through. On the evening a 1-5-4-1 defensive formation kept a clean sheet. They look physically strong, have players who are quick and have the height and organisation to defend set plays and also to be a threat at them. On the evening the opening goal was from a corner. You could see an organised, fit and hungry group of players, a supportive staff and a large following of supporters who probably can sense something positive is happening to their club since the exit from the Premier League in 2012 which was quickly followed by relegation to League 1 in 2013. A promotion back to the Championship the next season under Kenny Jackett, and new ownership in 2016. As is common place when new owners come into a club there is a change of Manager. The ex FC Porto Boss, Nuno Espritio Santo is now their 3rd Manager and on this early showing could be the man to bring them success. Wolves will fancy their chances to progress in the competition as they have a home tie against Bristol Rovers in the 3rd round. However I'm sure Southampton, who were beaten finalists last season against Manchester United, will be bitterly disappointed in not progressing. A good cup run can help build momentum and bring a feel good factor around a club and city. Southampton have a new Manager also this season in Mauricio Pellegrino and he and his team will be looking to learn the lessons from the game as they develop as a team and look to continue to progress in the Premier League. I was watching with interest the Reading v Millwall game which kicked off at 8pm on Tuesday evening. It was the return of Jake Cooper to the Madejski Stadium, however this time the former Reading youngster was playing for Millwall. Jake had come through the Academy and played for me in the Championship, as had several Academy graduates I had given 1st team debuts too. I always remember the late Academy Manager Eamonn Dolan saying to me when I joined Reading that he had great belief in Jake as a young man and is one you can trust. Eamonn as usual was spot on. Jake was in the U18 side when I joined Reading as Manager. He was very tall, 6'5"and still growing. However you could see a young man that, like several of the team, hungry to be the best he could be. As a staff we were very impressed with his attitude. He was in the gym at 7.30 every morning doing his stretching exercises. His desire to work hard was unquestionable with a resilience to keep going through adversity. An example of pushing himself to his limit was when we did the Vo2Max running test on the treadmill at Solent University in pre-season. Culture is very important if you want to be successful and who you surround yourself with has an affect on that culture. Jakes attitude was positively infectious as was the Captain of his youth team Aaron Kuhl. They both epitomised why so many of the young players had the positive attitude they had. Aaron Captained the U18 side to the semi-final of the FA Youth Cup and also Captained the U21 side that won the Premier League Cup. I'm really pleased to see that Reading Manager Jaap Stam is prepared to keep a pathway from the Academy to the first team and give the youngsters that vital experience required. Jake Cooper playing left side centre back for Millwall v Reading in the Carabao Cup. Millwall defending with 2 banks of 4 and Reading looking to play between the lines with Gareth McCleary, No12, in space on the 1/2 turn waiting to receive the ball. Millwall played a traditional formation of 1-4-4-2 on the evening looking to be very hard to break down. Setting up with a deep defensive block of two banks of four as you can see above. Four defenders with evenly spaced distances between each other and in front of that four midfield players also with even distances between each other. This is designed to minimise space for the opposition to exploit, and be compact enough as a team so that a Millwall player can close down quickly. Add two forwards in front of them and an organised defensive shape is established. Reading played a fluid game based around possession of the football that was successful for Jaap Stams team in finishing 3rd and reaching the play-off final last season. Reading had plenty of possession on the evening as they searched for a way to break down a resilient Millwall side that have been newly promoted this season to the Championship under the good Management of Neil Harris. An interchangeable 1-4-3-3 formation started the game for the Royals. A long range shot from new signing from Aston Villa, Bacuna, broke the deadlock, however Millwall quickly equalised. The tie eventually going to 30 minutes extra time. This allowed for the first time the introduction of a 4th substitute which is new in the competition. I was really pleased that Academy graduate Sam Smith who played centre forward and worked tiredlessly for the team with a constant desire to run in behind the Millwall defence, score his first goal at senior level and Readings third of the evening to send them through to the 3rd round to play Swansea City. It was also lovely to see Sam Smith mention Eamonn Dolan in his after match interview and how much it meant to him scoring at the Eamonn Dolan Stand end, as Eamonn had brought him to the club. Well said Sam. Could Wolverhampton Wanderers or Reading get their hands on this Carabao Trophy at the end of the competition ? You never Know ! The Premier League kicked off it's 2017/18 season at the weekend and I was interested in watching amongst other things the goals that were scored from corners. I've already alluded to the importance they hold in winning and losing games in previous posts. I've mentioned the importance of the quality of delivery. Is it in-swinging or out-swinging, and the pace on it into an area selected. I preferred a whipped in-swinging corner across the 6 yard line. Do the attacking team play a short corner looking to drag out defenders away from the goal and disrupt the defensive set up ? I've debated this at length with many colleagues in the game. Sometimes when defending it's better to allow the short corner because if the attacking team have an outstanding corner taker, his delivery will be a massive problem, for example James Ward-Prowse at Southampton. If the attacking team outnumber you with taller players, for example West Bromwich Albion who have the tallest team in the Premier League, they are likely to find a mis-match and win more 1v1 duals, then it could be a good idea to allow the attacking team to take a short corner therefore reducing this initial danger. The importance of defending the near post area is vital. Usually a player is designated this area to command and get the first contact onto the ball and clear the danger. If he doesn't and a forward gets the first flicked contact then the attacking team will fancy their chances of getting the next touch. Does a team set up with a defensive zone, requiring a player to clear the ball if it comes into his area. However does this give the advantage to an attacking player to get a running start and jump on the defender when attacking the ball ? Here Watford score against Liverpool with an in-swinging corner, with a quality delivery of the ball whipped in with pace across the 6 yard box inviting a Watford player to attack the ball. The distances between the Liverpool players on the zone of the 6 yard box are too far apart and the players designated to block the run of the scoring Watford player don't do it. The Watford player getting a running start and jump on the Liverpool defender who offered no resistance to the Watford player attacking the ball to score. It's interesting that Watford had a player on the Liverpool goalkeeper to disrupt him. Something I would always encourage. Interestingly Liverpool had no players defending inside either post of the goal. Also of interest Liverpool had all their 11 players back and defending inside the 18 yard box. Leicester City score with an in-swinging corner against Arsenal in a pulsating game at the Emirates Stadium in the first Premier League game of the season. The Leicester City player getting a run and jump on the zonal Arsenal defence attacking the ball to score. Interesting Arsenal had no players defending inside either post. Leicester City score from 2 corners in this opening fixture whereas Arsenal score from one corner, which was the winning goal in the 4-3 victory. Huddersfield score their first goal in the Premier League since being promoted last season with an in-swinging corner whipped into the near post area where a Huddersfield attacker runs into and gets the first contact on the ball flicking it towards the far post where the Huddersfield players had lost the Crystal Palace defenders, to score. Interesting Crystal Palace had no defenders inside either post. When I played as a goalkeeper at Tranmere Rovers and Wigan Athletic I preferred to have a man on the back post as I believed that any flick on from the near post area could take me out of the game and leave that part of the goal vulnerable. Corners play a big part in winning games of football. The quality of delivery is vital. The desire to attack the ball both in attack and defence, paramount to success. Attention to detail critical, discipline to be where you're supposed to be and when you're supposed to be within the team set up and taking responsibility for that role. The creativity to exploit the opposition. Will be watching with interest the corners again this weekend as we continue to follow the latest trends and continue to learn, seeking to find an advantage. I was watching with interest the opening day fixtures of the Premier League and was delighted to see one of my former young players, Dominic Calvert-Lewin, play an important role with an assist in Wayne Rooneys wonderful winning goal for Everton against Stoke City at Goodison Park. It was a superb cross into the danger area, between the 6 yard box and penalty spot, from Dominic for Wayne to score, however you must applaud the role that Wayne Rooney has in scoring the only and winning goal in the game on the stroke of half time. Firstly, Rooney works hard and wins the ball for Everton in his own half before laying the ball off and moving quickly into an advanced position between the lines of the Stoke City midfield and back line, offering himself as a link in building the attacking play. Next watch for Rooneys scanning to see what is around him before carefully passing the ball first time to a team mate. Rooney then offers himself in support of his team mate as an option. Once the Everton player, Sandro, passes the ball out to Calvert-Lewin in a wide position, Rooney realises he is no longer required in the position he is in. Look at his desire to move quickly into a space in the penalty area, passing the Stoke midfield and defenders and putting himself in a position for the team to score. Now Calvert-Lewin delivers an outstanding right footed cross for Rooney to attack. I must say the power he generated and the direction of the header was from top draw and goes down as my favourite goal of the opening weekend of the Premier League season. The celebrations and emotion of Rooney, the Everton supporters and players highlights why we love football so much and the happiness it can bring. Congratulations on scoring on your return to Everton and thank you Wayne Rooney for allowing us to see a master at work. Will be watching with interest how young Dominic Calvert-Lewins career progresses. It's certainly a positive benefit that he will be training with, watching and learning from one of the best forwards our country has ever produced. To be a Manager in the Premier League is a dream come true. I had the privilege of Managing Southampton on the first day of the Premier League Season on Sunday the 19th August 2012. We travelled to the Etihad Stadium and played the reigning Champions and title favourites, Manchester City, who were Managed by Roberto Mancini. We had been promoted two seasons running, from League 1 to the Premier League, a fantastic achievement by all connected with Southampton. To be away from home to play the Champions on the opening day was exciting. What was also exciting was the prospect of playing against Manchester United Managed by Sir Alex Ferguson, and Arsenal Managed by Arsene Wenger in three of our opening four fixtures. The other was against my old club as a player Wigan Athletic, Managed by Roberto Martinez. What a start ! I had a challenging decision to make regarding my team selection and the tactics for the game. Having watched Manchester City before and because they were at home against a newly promoted club, we anticipated they would play with a back four in defence and look to dominate possession, in their familiar 1-4-3-3 formation. Looking to wear us down and score with the talented players they possessed. I made the tough call to start club legend and one of my favourite ever strikers, Rickie Lambert, on the bench. This was because I anticipated City having possession and building their play, as all top sides do, from their goalkeeper, in this case England International Joe Hart. I believed this could be physically demanding for our talisman striker, so wanted to keep him fresh for the second period of the game to make a difference. In his place I utilised our Brazilian Striker Gully Do Prado. At 6'4" and with a turn of pace for the counter attack, I believed Gully was best placed to run around after the City defenders. Add on one wing our new signing Jay Rodriguez, who could run all day, and Jason Puncheon on the other wing. Jason had been outstanding since his return to the club and was playing with a maturity that I've enjoyed watching as his career has blossomed. Another big call I made was to start 17 year old James Ward-Prowse in the centre of midfield. Prowsey had been training with the first team since our time in League 1 and had already played for the 1st team the previous season, scoring in the FA Cup victory against Coventry. We had a philosophy to develop our own players. To do that there needs to be a pathway through the Academy into the 1st team. It's been a pleasure to see how James has progressed through his short career to Full International, having also Captained England U21's to victory in the Toulon Tournament, coached by present National Team Manager, Gareth Southgate. I had Managed against Manchester City Manager Roberto Mancini before. When I was the Manager of Scunthorpe United, we played Manchester City in the FA Cup at Glanford Park, and gave them a very tough game. I liked the Italian Manager, and as is customary, I went to see the opposition Manager after the game. I have always tried to ask a question in my quest for knowledge. I believe it's important in learning that you ask questions. We had a good chat after our opening Premier League contest. I asked him why he had decided to play a back 3 against us ? "You are a clever coach and wanted to surprise you" was his answer. I was humbled by this, and very proud that our club was being taken seriously. I was very proud of our team and travelling supporters on that opening day game. Kelvin Davis saved a penalty in the first half, having been awarded by World Cup Final Referee Howard Webb. We had a good compact shape about ourselves, however we conceded just on the stroke of half time to go into the interval 1-0 down, Carlos Tevez the goalscorer. I went down the players tunnel at half time thinking about what I was going to say to the players, however I went flying on my backside at the bottom of it ! It was my new shoes making me slip on the floor surface ! You always have a new suit and a new pair of shoes for a new season, especially a Premier League season ! I understand that following the incident, Manchester City changed the floor surface, and it's talked about as the reason they changed it on the pre-game stadium tours. You've got to laugh at yourself ! I was also very proud of the way we responded to going behind. A great team effort. We had a fantastic team spirit. I introduced Rickie Lambert into the game and he duly obliged to score the equaliser and send the travelling supporters, and the players, into joyous scenes of celebration. That's what football is all about. Another of our new signings Steve Davis also came on as a second half substitute. We had pursued Steve all summer and believed the ex Rangers Captain would be an ideal fit. The talented midfield player had had an operation at the end of the previous season in Scotland and still wasn't quite up to full match fitness and the exceptional physical stats that he produces during games. It has been said in the Premier League that you are at your most vulnerable to conceding a goal, when you have a corner ! Well we defended a Manchester City corner and having won the ball broke like the Red Arrows for Steve Davis to give us a 2-1 lead. Unbelievable scenes. Could it be possible ? Could we win ? Alas it wasn't to be, gut wrenchingly we lost in a pulsating game. A scrambled equaliser from a corner scored by Edin Dzeko and then the decider from an innocuous cross that we headed back into a danger area on the penalty spot that was superbly rifled into the net by Samir Nasri to send the City supporters home happy. This is how the Manchester City game was reported in the Southampton match day programme against Wigan Athletic. Fantastic memories. We had been preaching since we had arrived at Southampton in League 1 about scanning, movement, awareness and passing the ball quickly and calmly in preparation for the speed at which playing at the highest level in England, The Premier League required. It's when you are actually in the arena and playing against the Champions that the importance of practicing hard at these requirements are, how challenging it is, and the time you need to develop it. I had excellent coaches with us at Southampton in Andy Crosby, Dean Wilkins and Nick Harvey. We had excellent players with superb attitudes in the positive culture we had developed. Many players have remained in the Premier League and I'm proud of the progress they have made. It was interesting when we did the debrief of the City match what the players said regarding playing in the game. Jos Hooiveld our centre half, who had given the penalty away in the first half, said that he had a headache with the intensity of concentration required in keeping an eye on the talented Manchester City players movement and the speed at which the ball was passed. Welcome to the Premier League. Corners play a big part in football, they can make the difference between winning and losing. I went to many games last season in my quest to keep improving my knowledge of the game. Watching the top teams, the top players and the top Managers. How they set themselves up in their endeavour to win. I sat in different parts of stadiums to get a different view point other than the dugout. I found it fascinating to watch, I looked for trends. Always learning, searching to find an advantage. Standing on the Kop at Anfield brought back childhood memories. This time watching Liverpool v Chelsea. Attention to detail is paramount to success. I scrutinised many corners. The attacking and the defending of them. I kept asking the question Why ? Why had they set up the way they had ? What was their reasoning ? What had they seen to give themselves the advantage ? On many occasions I went with my former Assistant Manager Andy Crosby or Coach Dean Wilkins. Always good to debate a situation during the game. Asking a question, looking for an answer, what is the Manager thinking of now ? The quality of the delivery at corners is vital. For an attacking side, knowing the ball is going into an area and with the pace required to give the attacker the opportunity to score. Many teams seem to prefer the out-swinging corner to the near post area, maybe not looking to score from the 1st header but from the next touch. I preferred an in-swinging corner whipped in with pace across the 6 yard line. Just too far for the goalkeeper to come for and inviting enough to attack. Watching Manchester City play Chelsea at the Etihad Stadium. An out-swinging corner to the near post area. Plenty of combat skills required in the 1v1 duals. Winning a 1v1 dual, whether that be an attacker or defender can be priceless in gaining the edge. We were always looking for a mis-match in the 1v1's to exploit. The levels of concentration required is important. Discipline to be where you're supposed to be and when you're supposed to be. Manchester City setting up to defend a Chelsea corner at the Etihad Stadium. As well as man to man marking there are zones of the penalty area to cover. The near post zone area arguably the most important for the defensive team. If it's an in-swinging corner, the defender stands a step forward of parallel to the near post and edges a little closer to the post, as opposed to an out-swinging corner, where the defender stands a little closer to the 6 yard line. Small fractions that can make all the difference. Do you have one man on the post or do you have two men, one on either post defending the goal line ? Does that leave the opposition with a spare man ? Are you all in a defensive zone as defenders and attack the ball if it comes into your area. Does this give an advantage to the attacker as he can get a running start to attack the ball over a stationary defender ? Liverpool defending zonal, an in-swinging corner, against a bigger West Bromwich Albion side. These are only a few of the questions that need to be worked out. What suits your team best ? How do you deal with the team that has more bigger players than you, and likewise how can you exploit a smaller team than yourselves ? Do you leave one, two or even three players up the pitch when defending ? How can you improve your combat skills ? Are you clever to create movement and blocks to get a player unmarked for a chance to score ? Do you play a short corner to bring more defenders away from defending the goal area ? Who goes out for the short corner ? Is it one player or two ? We always made sure we had a man go from the post to then mark the corner taker once it had gone short, thus preventing a 2v1 situation. Do you play a short corner towards the end of a game if you're winning to deny the opposition the opportunity to counterattack from the corner ? It's said in the Premier League you are very vulnerable to conceding a goal from your own corner ! As the Premier League season is about to start I'm really looking forward to watching again in the impressive stadiums we have around the country, in my desire to keep improving, keep moving with the times, always learning and enjoying my football. A beautiful evening to watch the sunset at St.Marys as Southampton play hosts to Arsenal, who are set up zonally to defend a Saints corner. Stoke City Goalkeeper Jack Butland talking about his starting position at corners. Really enjoyed the Premier League launch on SkySportsPL and the interactive interviews with Dave Jones, Geoff Shreeves and Gary Neville in the build up to the Premier League season. Informative, opinionated and interesting programme. Well done to all concerned. Above is goalkeeper Jack Butland along with his Stoke City team mate and centre forward Peter Crouch discussing his starting position at corners. Set plays are a very important aspect of the game. The attention to detail in defending and attacking at set pieces can make the difference between winning and losing. The quality of delivery of the ball into a danger area and the desire of a player to win a dual, to score a goal or defend the goal, is vital. Always learning, I will be watching with interest the latest trends for set plays - Corners, Free Kicks and Throw-ins. It's going to be another exciting season to enjoy watching football, and the excellent coverage of the Premier League. Below you can see the media team in action creating the viewing as Dave, Gary, Jack and Peter provide the informative dialogue. Tranmere Rovers Team 1984/1985 - Team mate Neville Powell sitting on the right of the picture. A special day for my former team mate at Tranmere Rovers, Neville Powell, who is to have a Testimonial game against Everton U23's on Saturday 5th August, at the Bangor University Stadium, as a celebration of his time as Manager of Bangor City, between 2007-2016 at the League of Wales club. Nev won the League of Wales title in the 2010/2011 season, as well as winning the Welsh Cup on 3 occasions. I remember Nev was a 1st year Professional when I joined Tranmere as an Apprentice with Ray Woods and Roy Vernon in 1981. As part of an initiation, Nev and groundsman Larry Leadbetter tried to convince us to get into one of the wicker kit skips as a bet we couldn't do it. The idea was to then, once we were in the skip, close the lid, lock it, and leave us in the middle of the Prenton Park pitch ! Thankfully it didn't work, although I was halfway into the skip, when realising something wasn't right, and was saved from the ordeal. Tranmere Rovers 1st August 1981. Having just joined my local team as a 16 year old Apprentice, I'm in the goalkeeper shirt between Derek Mountfield and Dickie Johnson. 1st Year Professional Neville Powell sitting on the left. Will be with you in spirit Nev, sending congratulations and positive thoughts for a great day to you and your family. Opening Day Memories -Southampton - Off to a Flyer ! Southampton - Off to a flyer ! Following a fantastic pre-season programme, where everyone, players and staff, worked so hard for each other, Southampton won the opening game of the season against Leeds United 3-1 on 6th August 2011 at St.Marys. The 1st goal scored by the hard working Captain Dean Hammond, with a left footed shot, set us on our way to victory. Exceptional goals from the talented Adam Lallana and David Connolly along with saves from goalkeeper Kelvin Davis helped the team collect the 3 points. Southampton remained in the top 2 positions in the Championship season on the way to promotion to the Premier League. What was your favourite memory of the game ? Mine was the 1st goal from Dean Hammond, as it got us off to a flyer ! The opening game of the 2010 Championship season for Scunthorpre United was a trip to Berkshire to play Reading at the Madejski Stadium on the 7th August. Having performed wonders the previous season to retain Championship status, we knew at Scunthorpe United it was going to be another gigantic team effort required to do it again. We had learnt many lessons and were constantly striving to improve. The culture was good at Scunthorpe, with everyone grabbing an oar and rowing in the same direction. The defending and scoring goals at set plays, whether that be - Corners, Free Kicks or Throw-ins are crucial if you hope to have a positive season. Below big centre-half Rob Jones scores our winning goal in the 2-1 victory with a towering header from a 60th minute corner, much to the delight of the travelling Scunthorpe United supporters and the man who captured it on video, well done Andy Ford ! Opening Day Memories - Sheffield United - Nightmare 1st game in charge ! You want to get off to a good start in your 1st game as Manager of a new club. What you don't need is a 4-0 thumping ! That's exactly what happened in my 1st game in charge of Sheffield United on the 8th August 2015. A 4-0 defeat away at Gillingham. I always say to my players the first person I look at following a game in assessing the performance and result is me. 'Look in the Mirror' ask yourself the question, what could I have done to help the team ? As Manager I am responsible and accountable for the teams performance and result of the game. My role is to prepare the team, make decisions for the benefit of the team during the game and the situations that arise, the game management. Set plays play a major part in the winning and losing of games. Whether they be from - Corners, Free Kicks or Throw-ins. Being able to keep the ball out at one end and stick it in at the other end is important, over a third of all goals come from set plays. As Manager you have to face the media very quickly following a game. Emotions are very high after a heavy defeat like this one at Gillingham. Being able to control those emotions and say it as you see it is important. Expectation - The opening game of the season. The opening day of the season is important. Pre-season is over and everyone has been building themselves up for that first taste of the competitive season, and with that, the expectations of a good season. I've had winning starts, for example at Southampton on the 6th August 2011, we beat Leeds United 3-1 at St.Marys. We stayed in the top two all season on our way to promotion to the Premier League. And I've had disastrous losing starts. My first game as Sheffield United Manager resulted in a 4-0 defeat away at Gillingham on the 8th August 2015. I did enjoy however, as did the supporters of Scunthorpe United, our opening day 2-1 victory away at Reading in the Championship on the 7th August 2010. Big Rob Jones scoring a 60th minute winner with a header from a corner. Set plays are so vital, and play a major part in the game. My first game as Sheffield United Manager was a disaster losing 4-0 away to Gillingham on the 8th August 2015. Pre-season is vital in preparation for the season ahead. Set plays are vital to increase your chances of winning games of football. How you respond to a horrendous defeat following high expectation is important. There is no hiding place, especially with the passionate followers of the Blades. As Manager it is my responsibility and I am accountable for what happens on the pitch. I've always said to my players the first person I look at from the performance and result is me. 'Look in the Mirror' - How well did I prepare the team ? How did I react to the situations during the game ? What could I have done to help the team ? At times you wish you could be on the pitch to do something about it when it's going wrong, however you can't, players need to take responsibility. The interview straight after a heavy defeat is a challenge ! Emotions are high, they need to be controlled, what you say is important. Rob Jones scoring a header from a corner for Scunthorpe United at the Madejski Stadium against Reading in 2010. Fantastically captured on video by a happy travelling Scunthorpe United supporter. I'm really looking forward to the Championship this season as it kicks off on Friday with Nottingham Forest under the guidance of Mark Warburton, entertain newly promoted Millwall who have Neil Harris as Manager. My previous goalkeeper coach, Kevin Pressman, and former young centre-half, Jake Cooper. The other game is a mouth watering fixture as two of the teams expecting promotion this season, Sunderland now managed by Simon Grayson entertain Gary Rowetts Derby County. It's going to be very difficult to predict who will win the title, who will be runners-up and who will be successful in the play-offs. I would like one of the previous clubs I managed in the Championship, Reading, to do well after missing out in the play-off final last season. I hear good things about Japp Stam. I believe Middlesbrough may be best equipped from the three relegated Premier League sides to bounce straight back up at the 1st attempt. Always a very difficult task, however for the future of a club, a necessity. I know the consequences only too well, as the Manager of Reading following relegation from the Premier League to the Championship financial restructuring and ownership issues resulted in a challenging season. We only signed three players during pre-season to add to the reduced, relegated squad, and picked up several key injuries to important players. We narrowly missed out though on the play-offs, the last game of the season we drew 2-2 with Burnley. It looked to have been enough, before Brighton scored in the last minute of their game to take the final play off spot! All three relegated teams have changed their Managers. Middlesbrough have the talented young English Manager Gary Monk, who I believe having already cut his teeth in management at Swansea City and Leeds United will go a long way in the game. I believe it helps the cause that the owner of the Teesside club is an Englishman who cares for the local community and what a football club can bring to the area. Mr. Gibson is well respected, has supported the club through the ups and the downs, and knows exactly what's required. Sunderland have appointed another ex Leeds United Manager in Simon Grayson. Vastly experienced now, Simon did a great job during his time at Preston North End and has demonstrated that given time he can improve football clubs. The fans expectations are high, however I'm sure they will give Simon time to work his magic. Hull City have appointed a Russian Manager, Leonid Slutsky, who has not experienced the Championship demands before, so it will be interesting to see how he gets on in Humberside. One of my former players at Reading, Michael Hector has joined on loan from Chelsea, so I will be following with interest his fortunes. Sheffield United have the momentum now under Chris Wilder, another seasoned English Manager, who guided them to promotion last season with 100 points. The Blades had been languishing in League 1 for several seasons. Several Managers had tried to get them out of the division without success, and I was one of them. I had a season as Manager of the South Yorkshire Club, I was bitterly disappointed to have had my 3 year contract cut short. I learnt many things in my short time at Bramall Lane. Billy Sharp was the first signing at Sheffield United when I became Manager. A player I had sold to Sheffield United from Scunthorpe United in 2007. Billy had scored 30 goals in our title winning season. Billy also signed for Southampton where he scored some important goals in our promotion run in to the Premier League in 2012. Billy joined Reading on loan, however it was short lived due to the financial situation at the club at the time. I was delighted that Sheffield United was able to sign Billy from Leeds United, the only signing for a transfer fee. Billy was the leading scorer in my time at the club, and again scored the goals that shot the club to promotion last season. Across the City, Sheffield Wednesday have another goalscorer I had as a player at Scunthorpe United. We signed Gary Hooper from Southend United and following a successful couple of seasons with us, sold him to Celtic. Gary scored the goals that helped us reach Wembley twice at Scunthorpe, winning promotion, and an even bigger achievement in maintaining Scunthorpe's Championship status the following season. I will be following with interest how both players get on this season and who scores the most goals. It will be an exciting couple of 'Sheffield Steel Derby' fixtures that I'm sure the passionate supporters will be up for. I wish them well. Harry Redknapp at Birmingham City, Ian Holloway at QPR, Mick McCarthy at Ipswich Town, Steve Bruce at Aston Villa and Neil Warnock at Cardiff City, are vastly experienced Managers and all tasted success in the Championship. All good footballing people and all know what's required to get out of the division. Recruitment of players is critical to give Managers the opportunity to be successful, as is allowing the Manager time to develop his culture and the youth players. Fulham went close last season, and foreign Manager, Slavisa Jokanovic, did a good job. His experience of the division now, could give them the upper hand this season. I was pleased to see another one of my former players, Oliver Norwood, go on loan from newly promoted Brighton. Other clubs to have foreign Managers this season are at Norwich City, Leeds United, Wolverhampton Wanderers, and Sheffield Wendesday. All will be expected to gain promotion. Alex Neil at Preston North End has experienced promotion from the Championship and the experienced Phil Parkinson, did superb in getting Bolton Wanderers promoted last season. I will be following with interest former players from Reading, my captain, Jem Karacan and goalscorer supreme, Adam LeFondre. Four teams remain that begin with the letter B, in what will be a very competitive division. Nigel Clough at Burton Albion, Lee Johnson at Bristol City, Paul Heckingbottom at Barnsley and Dean Smith at the ever improving, and interesting way of doing things, Brentford. The Championship season is going to be relentless, is going to be brilliant to watch. We have some excellent Managers and big teams, with massive expectations. We will learn many things over the season. What we don't have though is a crystal ball. I certainly can't predict who will win the trophy I'm standing next to. Expectations - Where will these trophies end up this Season ? Who will win these trophies this season ? The English Football League starts this weekend and I'm really looking forward to watching a very competitive season with these splendid trophies on offer. I believe the Championship is going to be a fantastic spectacle this season. The aim will be promotion to The Premier League for many of the teams. We achieved this with Southampton in 2012, however we just couldn't get quite get our hands on this marvellous, historical trophy, as Reading ran out Champions. The majority of teams have already experienced the top flight of English football, and will believe they have a right to be there again. It's going to be very exciting. I'd like one of the former Clubs I managed in the Championship, Reading, to do well after the disappointment of losing the play-off final last season. Many teams will be in with a shout, so it will be very difficult to call. A good start is always important, when we were promoted at Southampton we stayed in the top 2 for the whole season, however teams have put runs together to finish the season strongly to win it, as Reading did when they pipped us for the title. Middlesbrough having come down from the Premier League will have a strong budget and players. I like that they have a stable and experienced English owner with positive values of supporting the local community, understanding the importance of a Club to the local community, and developing young players. They have a very talented young English Manager in Gary Monk, who given the time I'm sure he will be afforded by the owner and fans, will return Middlesbrough back to the Premier League sooner rather than later. Sheffield United return to the Championship following several years languishing in League 1. They join neighbours Sheffield Wednesday, both will be determined to have the bragging rights of South Yorkshire, and with the fantastic fan base both clubs have, will go into the season full of expectation. Momentum is with the Blades and the success Manager Chris Wilder has achieved. I'm looking forward to the Steel City derby, and seeing which of my former players, Billy Sharp - United, or Gary Hooper - Wednesday, scores the most goals. League 1 will be no different in it's competitive nature. Teams climbing the pyramid ladder or in decline and on the downwards spiral. Whilst at Scunthorpe United we managed to get our hands on the trophy as we were crowned Champions of League 1 in 2007. We also gained promotion via the play-offs at Wembley in 2009. When I was the Manager at Southampton we also gained promotion in 2011 as runners-up, the first of back to back promotions to reach the Premier League. It will again be difficult to call the promoted teams in League 1, however I believe Scunthorpe United will go close. Another English owner with big ambitions and another excellent young English Manager in Graham Alexander. Charlton Athletic will have gained experience of the division last season and have another good young English Manager in Karl Robinson. The fall from grace for Portsmouth has been well documented, however gaining promotion last season with Paul Cook as Manager, an old team mate of mine at Wigan Athletic, has generated some momentum. Experienced and talented English Manager Kenny Jacket is now in charge and with a large following could keep that momentum going this season also. League 2, along with promotion, has the dangers of dropping out of the Football League and into the National League. Many teams having fallen through the trap door have taken many years to return. Infact some have never returned. Whilst I was the Physiotherapist at Scunthorpe United, the Club, Managed by Brian Laws, gained promotion from League 2 via the play-offs at the old Wembley in 1999 and also as League runners-up in 2005. Scunthorpe United, Coca-Cola League 2 Runners-up 2005. Scunthorpe United, Nationwide Division3 Play-off Winners, Wembley Stadium, 1999. Lincoln City and Grimsby Town were close derby rivals when I was at Scunthorpe United. Can Lincoln keep the momentum going under the Cowley brothers, who breathed new life into the Imps last season, with a great cup run and importantly promotion. Or can another vastly experienced English Manager, Russell Slade, bring success to the Mariners. We used to enjoy taking the family to Cleethorpes for Fish and Chips! The Checkatrade Trophy provides an opportunity for the Premier League Clubs to enter the competition and play their U23 teams. An opportunity for our talented young British players to gain valuable, competitive, playing time. Whilst at Scunthorpe, the trophy was formerly called the Johnstone's Paint Trophy. Unfortunately we lost in the Final after extra time to Luton Town at Wembley in 2009. The Carabao Cup is the latest name given to the League Cup. The competition that is open to the Premier League clubs as well as the Championship, Leagues 1 and 2. It's the first piece of Silverware to be won in the season. Not counting the Community Shield. The pressure on the big teams in the Premier League to win trohies is massive, so I wouldn't be surprised if one of them, either from Manchester, Merseyside or London win this year. The relentless nature of playing games Saturday, Tuesday, Saturday provides the excitement for supporters. Travelling the length and breadth of the country, supporting your team, visiting different grounds and cities, meeting new people and making friends. The highs of winning 3 games in a week and likewise the lows of losing 3 games in a week plays with our emotions. The optimism or pessimism of the fans you are surrounded by. The europhoria or mental torture of supporting your team. Aren't you just glad it starts again this weekend ! A very important member of the team is the Kitman, it has grown over the years especially at the highest level to the Kit Team. I remember at Renbad Rovers, my Birkenhead Sunday League team, that we would take the kit home after a game, give it a soak in the bath, then throw it in the washing machine, hang it on the line and then make sure it was folded and put in the kit bag ready for the following week. I progressed from this, to taking it to the local laundry on Woodchurch Road on a Monday morning, leaving it there with the laundry lady, and then picking it up the next day. At Tranmere Rovers as an Apprentice footballer we would be responsible for washing the training kit, hanging it in the drying room and then putting the kit out the next morning before training. We would help pack the match day skip, clean the boots and pack them in the boot skip to travel. We would have a check list to make sure everything was packed. We quickly learnt to get this right. Making a mistake is a valuable way to learn. If a player hasn't got a pair of boots to wear because you hadn't packed them, then the consequences of it make sure you don't forget again! At Tranmere I learnt to tie my boots together after a game before putting them in the skip. Easy to find a pair when unpacking the skip. If everyone can just do their little bit it makes all the difference for someone, usually the Kitman. When I first started at Scunthorpe United as the Physiotherapist in 1996, we didn't have much staff. Mick Buxton was Manager for several months before being replaced by Brian Laws. Graham Colby combined his role as the Groundsman and Kitman. Paul Wilson was the Youth Coach, with one player, as we were just starting up the Youth programme again. I would help pack the match skip before travelling. After away games I would take responsibility to make sure everything was packed away into the skips and bags and put on the coach. Making sure nothing was left in the changing room before departure. I remember early on at Scunthorpe, going to an away game to local rivals Hull City. After the game the players took their boots and kit off and just threw it on the floor, got showered and either got on the coach or went home with their families. I remember being left in the changing room all on my own with boots and kit strewn all over the dressing room. To say I wasn't happy was an understatement !!! I packed everything away and then had a shower. How was I going to get all the skips back to the coach on my own ? Eventually a player came back to find where I was because the coach couldn't leave without the kit, or me. We had a meeting the next working day, I said my piece to the players and from then onwards everyone took a part in carrying something from the coach to dressing room and then back to the coach after games. Keeping players grounded and Team work ! In his book Legacy, James Kerr talks about the culture of the New Zealand All Blacks and 'sweeping the sheds'. I remember on one occasion having to have the boot skip in my bedroom for the night. We had travelled down to a South Coast hotel and then trained after the journey. The team coach couldn't be parked at our hotel, the driver had to park a couple of miles away, so the boots couldn't be left in the side locker of the coach. We had no alternative but to keep the boots at the hotel, however, there were no hotel rooms to leave them in so I had to put them in mine ! The smell of wet leather boots in a wicker basket was not the best aroma to get to sleep in ! After away games we would go back to Glanford Park, the home of The Iron. We used to get the players that were left on the coach, sometimes only one, as the players had been dropped off at certain service stations closer to their homes on the journey back from the game, to help get the skips off the coach and into the gym which was close to the laundry room, in preparation to be washed. On many occasions I used to take the wet boots out of the skip and place them in the boot room to dry before Monday on Thursdays training session, depending on whether it was a Saturday or Tuesday game. There was nothing worse than coming into training on a Monday and the leather boots had been left in the skip over the weekend and were soaking wet to wear for training. Players love a moan and we used to have a few tasty words about it. As the Physiotherapist I also had to make sure, along with the kit, that the medical equipment was placed out in the dressing room on game day. We made sure on arriving at the ground everyone grabbed a bag of some description from the coach locker, and took it to the dressing room. On away games the players were good, we had set the culture from the early days. I like being organised, so was quite assertive in my instructions as to where to place the bags once in the dressing room so I could get organised. The players would then leave the changing room to look at the pitch, whilst I used the short period of time to arrange the dressing room area. If you can imagine not all dressing rooms are the same size and I can assure you we had plenty of experience of making the rooms flow and organising the equipment and the storage required at different times of usage whilst at the away venue. I used to do the pre-match massage for the players, and do the strappings for the ankles. Many times we put a table in the shower area to do this. Time management was critical in the short period between arriving at the away ground and going out to warm up. I used to do the team warm ups after the rubs and strappings in the early days at Scunny. I was also substitute goalkeeper as well on several occasions! I loved the organised chaos and banter. It's something you miss when you're not in the game. Over the years it has changed and more members of staff have been introduced into the kit team. I enjoyed my time doing it. The experience of finding out how to utilise time and space and what works and what doesn't. The collaboration of the team. Camaraderie -Sharing a laugh on arriving in Jersey for Scunthorpe United pre-season tour, 2009. Against all the odds the foundations set for achieving the goal of staying in the Championship that season. Ian Baraclough, Andy Crosby, Kevin Pressman and Alex Dalton. Scunthorpe United Pre-Season trip to Jersey July 2009. The van, driven by Al and KP survived the sea crossing, to get the equipment to the hotel ! We had progressed as a club over the years from when I started as a Physiotherapist. In our first season in the Championship, Assistant Manager and Player Andy Crosby, Coach and Player Ian Baraclough, Goalkeeping Coach Kevin Pressman and Physiotherapist Alex Dalton would organise putting out and collecting in the kit on away games. After a couple of years as Manager we had managed to get young Nick Crawford the job as Kitman and he travelled with us to games. A local lad who was hard working at his role. Jo used to do the laundry and Graham was able to concentrate more time to being the groundsman. Collaboration - Assistant Manager Andy Crosby, Coach Ian Baraclough, Kitman Nick Crawford, Physiotherapsit Alex Dalton and Goalkeeping Coach Kevin Pressman. Fantastic togetherness and spirit. Eating together during Scunthorpe United pre-season training camp for the Championship Season, July 2010, Champney Springs, Leicestershire. Newly appointed Kitman Nick Crawford preparing to do his initiation song during Scunthorpe United pre-season training camp for the Championship Season at Champney Springs in Leicestershire July 2010. Since I have been a Manager I've always taken an interest in how the kit technicians operate. I like to think I've always been supportive of the very demanding role. The more information I can give them, and as early as possible, the better. It's pre-season now and the travelling, different countries, locations, games come thick and fast, the turn-over of getting match and training kit washed and dried is relentless. New players are likely to arrive, what is their kit number ? Shirt size ? How many footballs do we need ? Bibs ? Cones ? Mannequins ? and the latest modern trending equipment ? The kitman would like to know as early as possible what the travelling squad is so they can pack the kit and boots and not leave any at the training ground. Understanding every players requirements is vital and the Kitman is a good source of banter with the players. He or she is close to them, they have to have thick skin to take the banter from the players and likewise able to give it back. It all adds to the camaraderie required in making a team a family. This leads to success. I follow with interest on social media how the size of the departments have grown and the hard work that goes on. @Kitmanforbesy @Southampton was a good team member whilst I was Manager at Southampton, a man with many life experiences to share. I enjoyed his company, however bad his jokes were ! The present Mrs. Forbes should be very proud of him. Following with interest - the careers of my previous players and staff. Having worked with many talented young players and staff over the years, I've always been keen to follow their careers with interest. How are they developing as players and as people ? Have they reached or surpassed their early potential ? Have they lost their way ? Have they been injured ? Are they being good role models ? As a Manager of a Football Club you have many responsibilities. The 1st Team has to win! That is taken for granted, however, with the big number of Managerial sackings, it's not easy ! Another responsibility I believe is to provide a pathway to the 1st Team for the young players. If they are not going to make it in your 1st team, then we still have a responsibility to keep developing the players as professionals and help them stay playing the game at a suitable level. To be the best they can be. I strongly believe that we have also a responsibility to surround the youngsters with a culture at a football club that helps develop them into good people, with values that are solid and respectful. This can take time to establish at a club. Time not afforded to many Managers in the modern game. Senior players help to play an important part in this, and it's important to have good ones with you at a club, to be role models in helping the youngsters achieve the best they can be. I've been fortunate to have had some outstanding senior players. The cascade learning of sharing their experiences as players, in life, and in the world of professional football should not be underestimated. They may be coming towards the later stages of their careers, however how they conduct themselves, how they train, the standards they set, the standards they know that are required by the Manager and the Football Club are invaluable for a young player to see and be surrounded with, as he starts off on his career pathway. I've been very fortunate that I've had the privilege to work with some outstanding people who have been well respected members of my staff. The staff at a football club are critical. It is how they help develop the youngsters whether that be a young player or a young member of staff. Sharing experiences is important in developing people. We all make mistakes and we all fail at something. It's the lessons you learn from these mistakes and failures that ensure you become successful in life. You have to make decisions and you need the endeavour and effort to keep trying to attain something. You need the grit and resilience to keep going when things are going against you. I watch with interest, and pride, on how the young players and staff I have had the responsibility for, flourish and grow throughout their careers. The collaboration between the coaching staff is paramount to a training session. The ability to plan and prepare a session to include intelligent decision making, creativity, fun, physical, technical, tactical, mental and social compartments requires the coaches to communicate, have an honest conversation, debate an issue, putting forward strong suggestions in what could work better for the good of the cause. A trust and bond forms as they are a team working together. TEAM- Together Everyone Achieves More. All concerned will have an important part to play in making the session a success. Maximising the time available to maximise the performance of the players. Collaboration between the Coaches in finalising the planning for the morning training session during Southampton's 2011 pre-season tour to Interlaken in Switzerland. From the left 1st Team Coach Dean Wilkins, Head of Sport Science Nick Harvey and Assistant Manager Andy Crosby. Above is a picture of my coaching staff at Southampton during our pre-season tour to Interlaken in Switzerland in 2011. The collaboration between Andy Crosby, Dean Wilkins and Nick Harvey was outstanding and was paramount to making the pre-season tour the success it was. The foundations for the successful promotion season were laid during the important pre-season period. The attention to detail by the guys was phenomenal. No stone was left unturned in the planning and preparation for every training session. It provided our very talented players with the opportunity to maximise their abilities, be challenged, use their intelligence, problem solve, make decisions, and improve. Utilising technology and coaching we worked together to gain maximum physical outputs. The use of GPS - Global Positioning System, monitors, ensured we could track every session and the physical work carried out by the players. The training load, the distance covered in the session, for example - walking, running, high speed running (HSR), sprints and changes of direction, whilst also monitoring the heart rate exertion of the players. Working together, the coaches could define area dimensions, the length of time during and between the blocks of training for maximum physical benefit. We would prepare position specific sessions. Technical and tactical elements were catered for in how we wanted to play as a team. All sessions videoed for feedback and analysis by the coaches and players. The importance of decision making by the players is crucial in developing free flowing football. Challenging the players to make intelligent decisions within the session. The players need to have an understanding of working together, positive and intelligent mentality in problem solving, adapting to the changing situation of the game, the challenges of a moving game and the opposition. Who can quickly seize the opportunity and lead in that particular moment. The collaboration of the players to work together, quickly adapting to situations and making decisions. Not just relying on the coach to do everything for them. Below is an example, we call it the gates game, using 2 teams 10v10. Pitch dimensions of 18yd box to 18yd box and full width of the pitch. 2 poles a few yards apart form a gate, several gates are positioned randomly around the pitch. A set time period for continuous play then a short timed break for a drink and coach feedback before another block of the game. As part of our periodised training programme these times altered, increasing in time and decreasing in rest period. The players are asked to keep possession of the ball and either pass or run the ball through the gates, thus scoring a goal. If the opposition win the ball, the team who had just lost it are encouraged to get it back straight away, by pressing the team which now has the ball. The team that wins the ball needs to get it away from the pressing opposition as quickly as possible and look for the outlet pass, free available team mate, and then find space on the pitch, stretching the opponents out of a compact shape, getting into a flow of passing and looking to score through the gates. Key words and phrases : Movement, Awareness, Scan, Head up, Pass the ball quickly and calmly, Get the ball back and Press are encouraged. The collaboration as a multidisciplinary team we had at Southampton was important to me. The sessions we created as a coaching staff in particular Andy, Dean and Nick cleverly provided the framework in which the players could develop into intelligent, creative, decision making, elite athletes, who developed technically and tactically, becoming resilient, emotionally intelligent and forging that family bond that achieved the season goal of promotion to the Premier League. You can tell a lot about a persons character by playing a round of golf with them. It's a game where if your confidence is high you can hit a good shot nearly every time. Love a game of Golf, preparing to hit the ball 'straight down the middle' in Portugal. It's how you respond to a bad shot that is the interesting aspect for me. Can you get over it and move on or does the thought of the bad shot linger in your mind and you loose confidence and then that affects your next shot, which turns out to be a bad one again. You then become frustrated, and become unable to hit another good shot. You loose heart in playing the remaining holes of the round, especially if your partner is having a good round, and can't wait to get off the golf course and into the 19th Hole - The Bar ! When I was the Manager of Scunthorpe United, we had just won League 1 in 2007 and had been promoted to the Championship for the first time. The second tier of English football had only been reached many years previously in 1958 and lasted 6 years until 1963 before relegation. I knew it was going to be a challenging task. A very small budget compared to the rest of the division. Average crowds of 4,000, which was good for the percentage of people who actually lived in the area. I needed something to keep the players confidence high during what is a long, demanding and relentless division, with many games coming thick and fast. Saturday, Tuesday, Saturday. Week after week and month after month. Using an example from golf, Jon used the world famous Tiger Woods as the example. Tiger would use a pre-shot routine before hitting the ball. On his approach to the ball from his previous shot, he is already gauging what shot to hit next. How far is the ball to the hole. What is the lay of the ball like on the ground. Once he had selected the club he was going to use and visualised the type of shot he was going to hit, for example a fade into the green, the next stage was when he actually placed his hand on the club and drew it from his bag. Jon, who later worked in golf with the PGA, would say that once Tiger had committed to his club selection his timing to actually hitting the ball was within a second every time he did it during a successful round. Now how many amateur golfers who hit a good shot automatically and quickly reach down to pick the tee up off the floor on which the ball had been placed and not look at the ball in flight. How many golfers look longer at the bad shot, that is for example hooked, to see where it has landed so they can find it. If you look at the flight of the ball on a good shot, it is embedded in your memory for the next time. Maybe a bad shot is also embedded in the mind. How many times and for how long have you been thinking about the bad shot. Which one is likely to be playing on your mind the next time you play a shot. So Jon's suggestion was this, that Tiger Woods, the leading world golfer at the time, would after hitting his shot, walk for 4 steps and then cross and imaginary blue line. That in his mind was the end of that shot and then onto his preparation for the next shot. We used this idea at Scunthorpe United. It was our way of attempting to keep confidence high. Our way of moving on from one game and onto the next one. I'd asked the players what a training ground environment looked, felt, smelled and sounded like when confidence is high and you are winning games. Remember we had just won League 1 and as Champions of the division knew what it was like to win. We knew what that feeling was like. Scunthorpe United with that winning feeling. Champions of League 1 in 2007. Following a game I would debrief it a day or two later with the players. We would go through what had happened in the match and what lessons we could learn from it. Video analysis has many benefits now. Anyone would then be able to get anything off their chest about the game. I wanted us to Flourish, I would ask the players for 5 positive and 1 negative experience about the game and write them on a flip chart, and then I would draw a Blue Line underneath the name of the team we had just played. We would then move on with our preparation for the next game. I continued to use it at Southampton, Reading and Sheffield United. I've also found it a beneficial way of being able to move on. Flourish - 5 Positive and 1 Negative from the 3rd Round FA Cup game over Blackpool. A Blue Line - move onto the next game in Southampton's League 1 promotion winning season 2011. Collaboration - Together as One ! Collaboration between all departments at a Football Club is vital if you want to be successful. From the Owners, the Board of Directors, Manager, Coaching Staff, Medical & Sport Science Department, Analysts, Kit Technicians, Groundsman, Chefs, Administration staff tucked away in an office, the sizeable Academies we now have, the Cleaners, Media, Commercial and Community Departments, the Coach Driver and between the Players - in the team, out of the team, young players making their way along the pathway to the team. It doesn't matter how big or how small the role is, if you're involved, you have an important role to play in making the Club a success. Successful families are successful teams. The spirit and culture of everyone connected and collaborating, understanding the big picture of want it is you have set out to achieve, where you want to go to, valuing and respecting the people you surround yourself and work with, it can take you a long way if you are, Together as One ! As many teams are away on pre-season tours at the moment, a couple of examples of collaboration from Southampton's successful 2011 tour to Interlaken in Switzerland are below. Firstly our Groundsman Andy Gray playing his part in laying the foundations during pre-season for our promotion winning season. Head Groundsman Andy Gray played his part in Southampton's successful pre-season tour to Interlaken in Switzerland in 2011. He travelled over before the touring group to prepare the training pitches. This ensured the quality of the playing surface for the sessions required at the elite level. I had the pleasure of travelling with Andy to assess our training camps well in advance. In 2012 we had a trip over to Evian in France in preparation for Southampton's pre-season tour. It was good to spend time with our Head Groundsman. We had spoken most days at the training ground at Staplewood in Hampshire, however with just the two of us travelling this time, a longer period without interruptions was beneficial. Andy and his staff were good at their jobs and spending time with him I was able to fully appreciate his expertise as a groundsman and get to know him a little better as a person and family man. It also reconfirmed to me that we had good people working with us at Southampton. Job well done Andy. Now back to Southampton to make sure the training pitches are ready for when we return from the Tour of Interlaken in Switzerland. Another example of collaboration from the tour is with long standing Club Physiotherapist Mo Gimpel, who was now the Head of Medicine and Sport Science, and some of my other valued coaching staff. Every morning at breakfast, Mo would touch base with every player and using an Ipad would take a very simple wellness check of the players asking them a few simple, however valuable questions. Marking themselves out of 10 the players answered 1. How well did you sleep ? 2. Muscle soreness if any and where ? 3. Joint pain if any and where ? 4. Motivation to train this morning ? Mo would then sit down with Assistant Manager Andy Crosby, 1st Team Coach Dean Wilkins, Head of Sport Science Nick Harvey and myself, and we would go through every players scores. This allowed us to have an idea as to the players condition going into the planned morning session and any changes Nick, Andy, Dean or myself felt we needed to make to implement it. It's vital you work smartly during pre-season. I would want the players to train every day, however with my experience of 35 years of pre-seasons and 10 years as a Club Physiotherapist at Scunthorpe United, that the increased risk of injury during pre-season, a period when you are overloading the body to improve fitness levels, is high. Previous data from an FA Audit of injuries has proved this. Given the information gathered by Mo a discussion would then take place as to the risk factor to the player. We had a planned periodised training programme for not only pre-season tour but for the whole season. If a player had marked that he had had a poor nights sleep for example, Mo or one of the staff would have asked the player why ? It could be that the room was too hot and he was restless or the mattress was not comfortable or his room mate was snoring ! This wouldn't stop him training, and would be a simple solution for the next evening. Sleep is vital to recovery, especially when in a high intensity period of training like pre-season. If the player had marked a 9/10 for muscle soreness, this would be flagged up. Again asking a question to the player why ? Listening to a player who knows his own body is vital. A player should take notice of his body and how it is responding to training. I used to say to the players 'you are a self employed businessman and your body is your business, take care of it. We can surround you with expertise and educate you into why things are beneficial however it is you the player that must take responsibility'. A simple explanation for the players muscle soreness could be that the previous days training session was very hard for him. A player could score a 9/10 on his R.P.E ( Rate of Percieved Exertion ) This is a simple mark the players record after a training session. He had then developed DOMS (Delayed Onset Muscle Soreness) today. Why was this ? Had he gone through his recovery protocol after training ? We called this 'Taking Care of Business' Several things that aid recovery following a training session. Re-hydrate, fluid intake - water or an electrolyte. This will have been lost with training especially in hot climates. A protein or carbohydrate shake to aid muscle repair. Food ! Nutrition is so important to an athlete especially for recovery. We had the excellent Mike Naylor of the English Institute of Sport educate the players on Nutrition. Swim - After every morning session in Interlaken we would bike back towards the hotel, stop off and jump into the beautiful ice cold lake. Water immersion is beneficial to muscle recovery, what the correct temperature is though is open to debate. Sleep, get your feet up and rest. The players 'Taking Care of Business' and having fun. Jumping into the beautiful ice cold water after training during Southampton's successful 2011tour to Interlaken in Switzerland. Had he missed something ? If so why ? He would then be assessed by the physiotherapist to make sure there was no muscle tear. On the back of this information we would decide his part in the mornings training session. I want every player to train every day, missing a single session is a wasted opportunity. However sometimes you can modify a players load during a session. For example if the session involved 12 sprints maybe we reduce his to 8 sprints. Mental toughness is a major part of Elite sport. Sport hurts and a player needs to push himself to be the best he can be. I've mentioned in a previous post on pre-season testing, and gauging the attitude and character of a player when asked to perform a VO2Max test on a treadmill, and if he has the desire to truly push himself. Planning and preparation are key to success however the ability to adjust the plan is critical. Our daily breakfast meeting as a staff allowed us to make sure we could maximise the time during the next training session. Be smart in how you train, and when you train make sure your intensity is maximum. Otherwise it's a wasted opportunity to improve. Left to right. Mo Gimpel Head of Medicine and Sport Science. Dean Wilkins 1st Team Coach. Nick Harvey 1st Team Head of Sport Science. Andy Crosby Assistant Manager. Collaboration. Discussing the players daily morning wellness scores during Southampton's 2011 pre-season tour to Interlaken in Switzerland. I've highlighted the tour to Interlaken in Switzerland with Southampton in 2011 as a small example. I've been very fortunate to work with some very good people. I believe it's important to surround yourself with good people. To develop the culture that can bring you the success you desire. There's a book by Jim Collins called Good to Great. He mentions about getting good people on the bus with you, and then deciding what seat they will take on it. It's the time of year when the majority of football teams head off during pre-season training for a tour. There are several reasons behind leaving our shores in the UK, with anything from 5 days to 2 weeks in a foreign country. The idea of bonding a new group of players together and setting down the tactics for the season combined with the benefits of living, eating and training together in a warmer climate enable a new group to build a cohesive team spirit and get to know each other on a personable scale. The transfer window ending after the season has started however presents many challenges to this though, as the many squads are still in transition during the pre-sesson tour, with uncertainty as to who my be joining the team and who may be leaving the club. The global expansion of our game especially in the Premier League, means many of the bigger clubs travel long distances to engage with supporters, not just on television but up close and personal, and to build the brand. Sponsorship is important and worldwide exposure is required to meet the ever spiralling costs involved in the modern game. America and Asia are popular destinations. The long flights, with different time zones to cross affects sleep - vitally important especially during pre-season. The differing weather conditions, heat and humidity affects the hydration levels of the body - poor hydration levels increase the risk of injury and decreases performance. The importance of exercise, getting fit and understanding the coaches tactics for the season require the training area or match pitches to be of the standard required of elite sport - the risk of injury with uneven or very hard un-watered ground can have disastrous consequences on a players and teams season. I've been involved in pre-season for 35 years and been very fortunate to travel to some beautiful places in the world and train surrounded with breathtaking scenery. Surrounded by breathtaking scenery during pre-season training. This is in beautiful Interlaken in Switzerland with Southampton in 2011. The pre-season games allows teams to play against other teams they wouldn't usually meet. This can be an exciting change and being able to perform against opposition of different levels, differing cultural mindsets in how they play the game - very defensive, possession based, direct play or counterattack, can be beneficial. However sometimes if the games are not controlled correctly by the officials, the competitive nature of football can get out of hand physically and unnecessary injuries occur, again being detrimental to the season ahead. I've always enjoyed taking in the culture of the place we have visited on the pre-season tour and not just be in the hotel room, training pitch and then hotel room again. I believe it's important to embrace the culture, a visit to a local landmark, understanding how the people go about their daily lives, the food and drink of the area - all helps expand our knowledge of the world we live in. The supporters are the lifeblood of any team. To be able to look forward to a summer holiday supporting your team in a different country is exciting. I know many fans want to know as early as possible where and when the team are going on tour so they can plan accordingly to travel as well. I know from personal experience of supporting the British Lions on their 2005 tour against the All Blacks in New Zealand how fantastic it is. The ability to plan the route and travel around the South Island of New Zealand following the team was amazing. The ability to take in the culture, see the local sites, the local food and drink and meet the local people enlightening. Places I've enjoyed going to for the pre-season tour and have fantastic memories of include, Russia and the Isle of Man with Wigan Athletic, Jersey, Limerick, Ibiza with Scunthorpe United, Interlaken in Switzerland and Evian in France with Southampton, and Portugal with Reading. Taking in the culture and famous landmark St.Basil's Cathedral, Red Square, in Moscow, Russia, 1990 on tour with Wigan Athletic. Club tracksuit was in style back then !